Road Trip Bingo is a super fun and easy way to keep kids occupied during long car rides. All you need is these printable cards and a crayon, pencil, or marker to enjoy a peaceful car ride while the kids hunt for signs and vehicles. 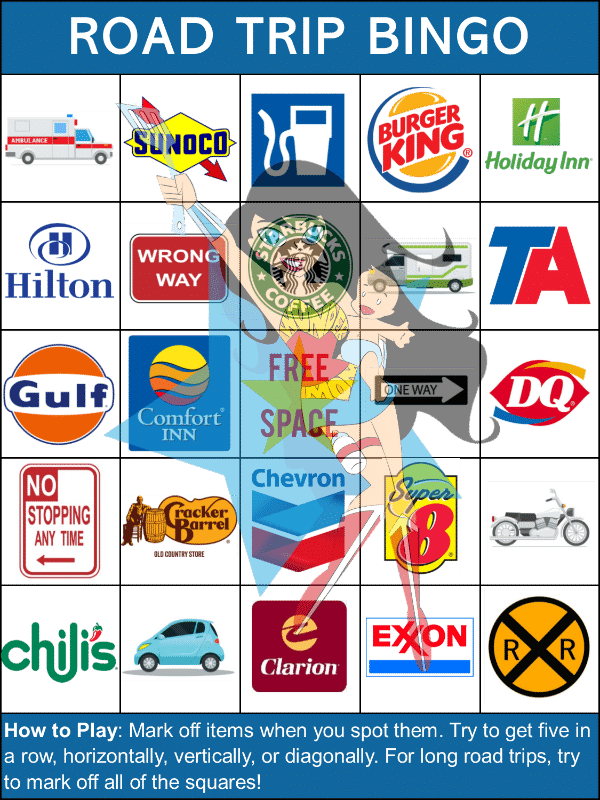 Road Trip Bingo is a lot like traditional bingo. The main difference is that you don’t need a caller to announce the square to mark off/cover. Instead, kids scan their surroundings through the car window to find signs and items to mark on their cards. Single Line – Mark off all five squares in a straight line. The line can be vertical, horizontal, or diagonal. Four Corners – Mark off the four corners of the board (top left square, top right square, bottom left square, bottom right square). X – Mark off BOTH 5-square diagonals to form a large “X”. Box – Mark off all the squares along the outer edge of the card (top row, bottom row, far left column, far right column). Blackout – Mark off all of the squares on the card. If you have more than one child, they can compete to see who can get bingo first. The winner can choose where to sit in the car (where safe), what song or station to play on the radio, or where to stop for a snack or meal. A child can compete against himself by seeing how many squares he can mark off each trip or during each leg of a long trip. 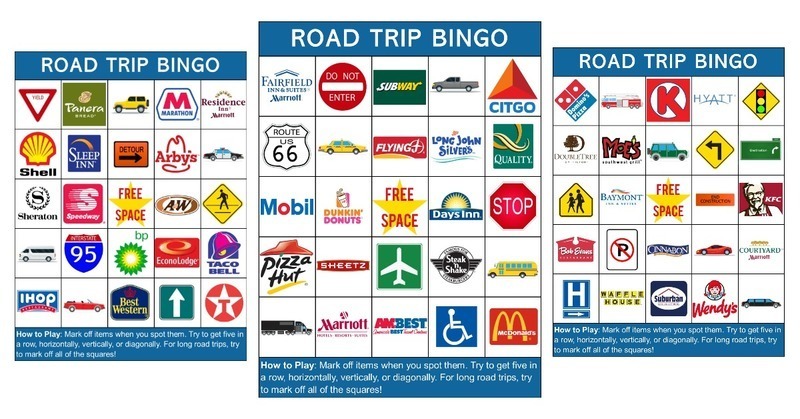 If you want, you can simply print the road trip bingo cards on plain printer paper. The cards are sized for letter-sized paper, with two cards per page. I like to print mine on cardstock so they are sturdier. Then, I laminate them so we can reuse them. If you don’t have a laminator, you can use self-adhesive sheets or just slide the pages into page protectors. Then, the kids can use dry erase markers to mark their cards. Wipe off with a napkin and you’ve got a clean board ready for a new game! I actually prefer transparency markers since they don’t wipe off on the kids hands when they rest their hands on the bingo cards. You need a wet wipe to clean the cards off though. You can clip the bingo cards onto these small clipboards and keep the marker in the pen holder to make it travel-ready. Each of the four cards in this set is unique. Other than the free space in the center of each card, none of the items appear on more than one card. If you have one child, this allows him or her to play a completely different version of the game on four different road trips. If you have more than one child, this means each child will be looking for different items so no squabbles about who spotted something first. The instructions are printed on each card (see sample above). Just fill in the form below to subscribe to my newsletter and get the complete set of four cards without watermarks. You can unsubscribe any time. If you remain a subscriber, you will receive one to two emails per week. 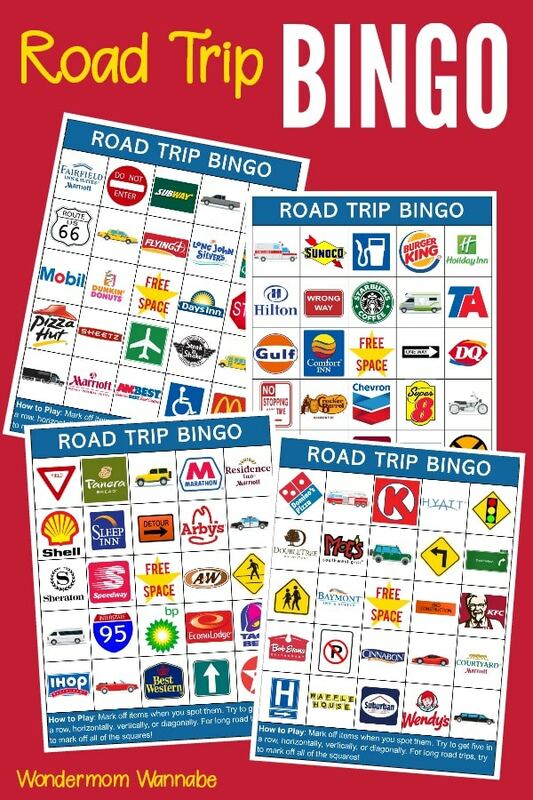 We are planning a big road trip up North this summer so these bingo cards will be perfect! Thanks! Can’t wait to print these off! I love these travel Bingo cards. Such a fun way to keep kids entertained during a long drive!